This picture was taken a year ago at my daughter’s wedding. It was supposed to be outside, only it rained. She was a beautiful bride. Don’t you love the boots! I want you to squint your eyes when you look at the picture, What do you see? A blur of shapes? Keep squinting and you should notice that some of the shapes are dark and some are light. I’ve learned that squinting is a valuable tool when you’re trying to see values. I didn’t have a clue what values were when I first learned to paint. It took me awhile to understand, not only what they were but also why they are important. An aha moment came with this explanation: Value in a painting is the darkness or lightness of a color. 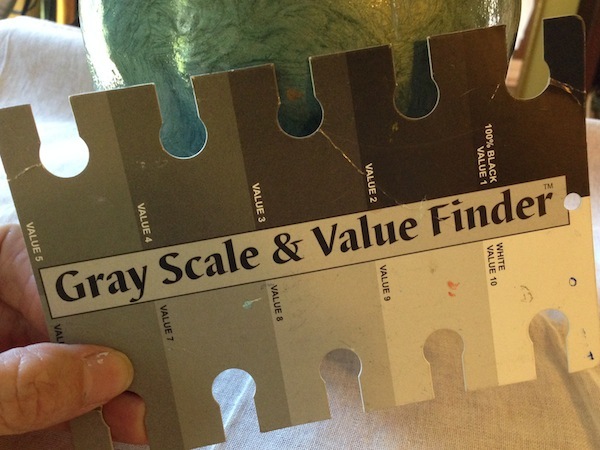 One other trick is to use a value chart to double check a specific area or color. 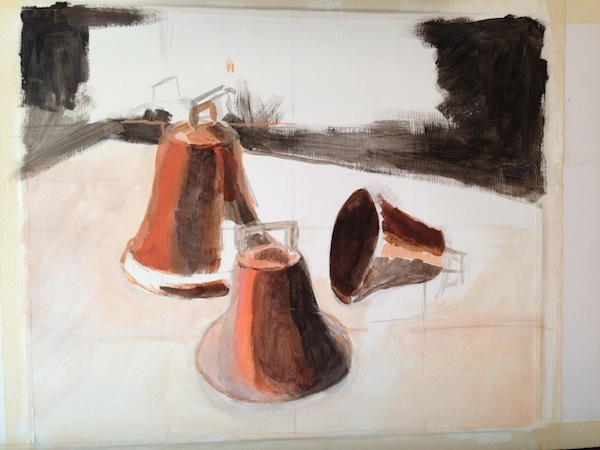 So … I may have a better understanding of values, but seeing them and then getting them right in a painting is another story! Even if you convert a color picture to black and white, trust me — nothing is EVER only black and white. It’s always 50 or more shades of gray! In real life, the human eye is capable of seeing more than 500 shades. Imagine! In my 2D design class, we had to make our own value scales. It was a stretch to lay down only seven different shades, but it helped me appreciate the subtle shifts in value. 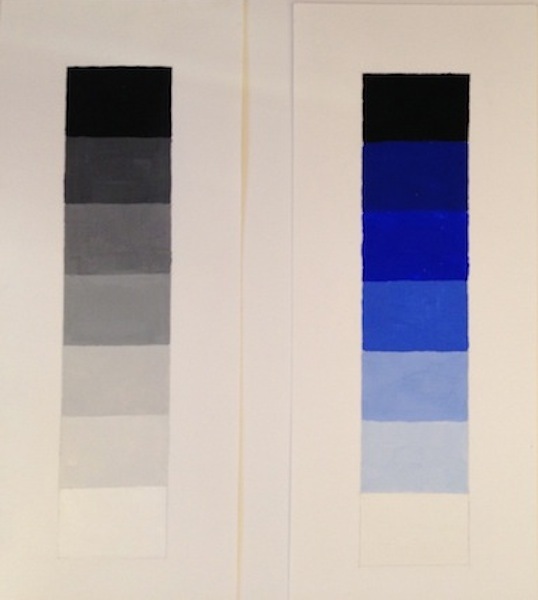 This semester, one of our first homework assignments was to paint three objects using only black, white and one color. 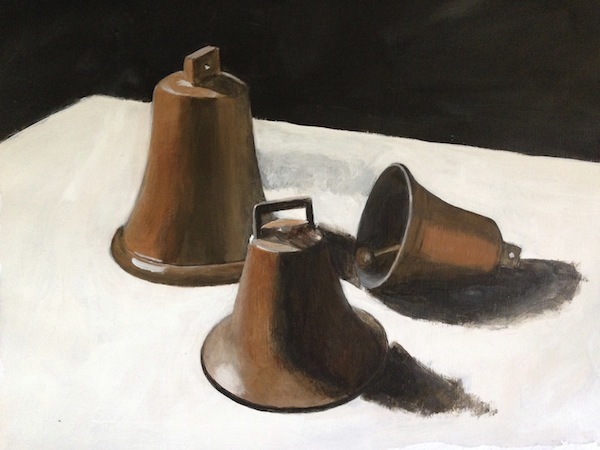 I chose three old cow bells. It took a lot of squinting to see their values. I mixed red and yellow to make a warm orange and laid down strips of darkened and lightened color. After some late nights of painting (it’s the life of a college student, even at my age), here’s what I created. 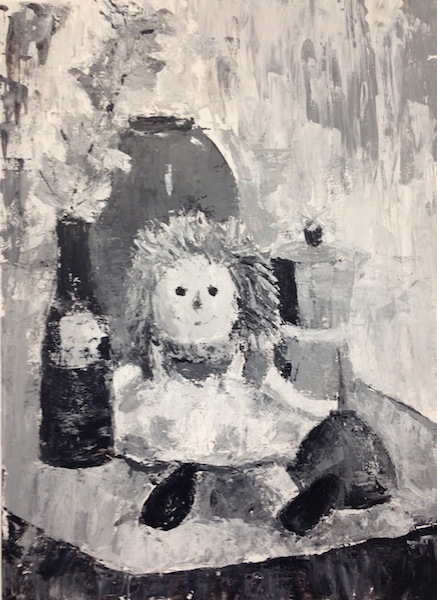 Jim set up a busy and colorful still life in class, which he had us paint in black and white — with a palette knife. Once again, it was all about values. I enjoyed using the palette knife. Cheers, Raggedy Ann! Our next setup was as subtle as Raggedy Ann was dramatic. We had to paint a piece of fabric and show the folds and how they move in and out of light. 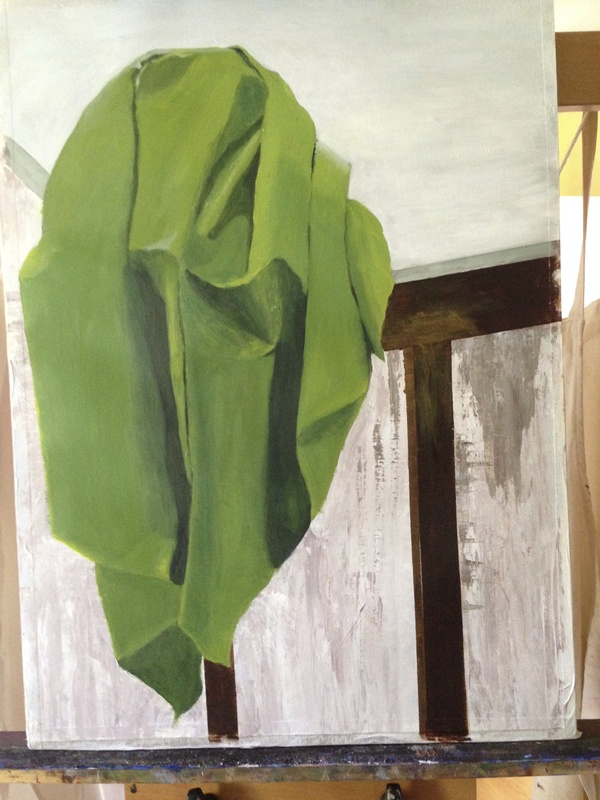 I remember my former drawing teacher Lucy Ellen Smith telling me how much she loves painting drapery. There is something satisfying about it, but it’s so, so hard! I sent Lucy a message and asked for some advice. 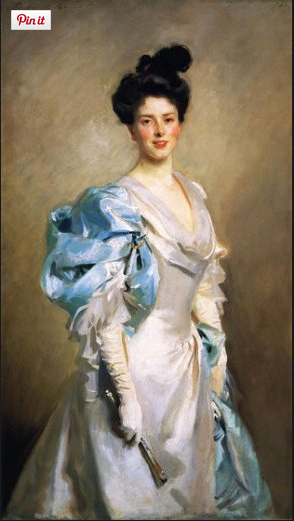 Lucy considers John Singer Sargent the 20th century master of drapery painting. I’m stunned when I look at paintings like this. I could get discouraged and tell myself why bother even trying? You’ll never be able to paint that well. But, you know what? It doesn’t matter. Not only have I learned the value of values, I also know that to get better at anything, you have to keep doing it — practice, practice, practice! Whether you’re 20 or 40 or 60 or 80! 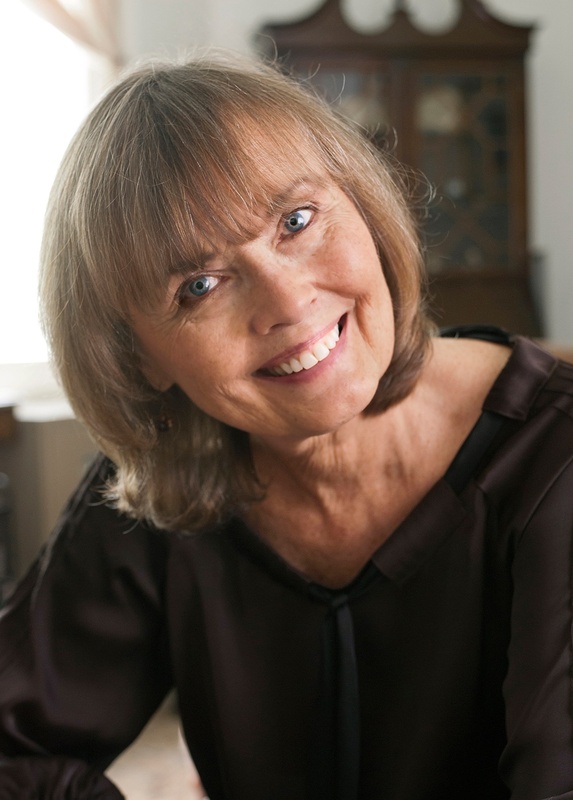 Are you still trying to get better at something you love doing?